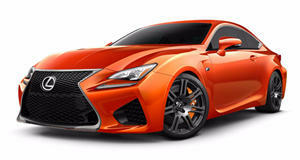 Bold coupe styling and a shouty orange paint job cut the Lexus RC F as a divisive figure in the sports coupe segment. Powered by an old school naturally aspirated 5.0-liter V8 with 467hp, the only drivetrain is rear wheel drive through an 8-speed automatic transmission. An optional Performance Package adds a torque vectoring differential, carbon fiber interior and exterior trim, a carbon fiber roof, and heated and ventilated front seats. Safety equipment includes optional forward collision warning, blind spot monitoring, and rain sensing windscreen wipers. 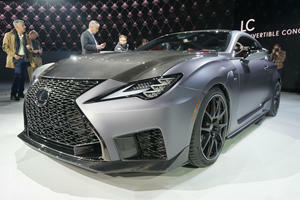 Coupes are notoriously cramped and difficult to enter and exit, and the RC F is no different. The front seats do slide forward on motors to aid rear ingress, but the movement is dreadfully slow. The fixed side bolstering on the sculpted front buckets also makes it awkward to enter for both front and rear passengers. Those sculpted front seats look fantastic, but they offer less room than any rivals and would best be described as ‘snug’. Rear seats offers even less head room due to a narrow foot well and a sloped roof. Thankfully, interior material quality makes up for this, with an abundance of materials that are all of luxuriant quality. But the interior is busy, and the design is cluttered and lacks ergonomic fluency. Controls are semi-touch responsive, but there’s no full touch screen or control knob – instead there’s a track pad that’s infuriating to use, especially on the move. The RC F is a strange Frankenstein’s monster of a build, inheriting pieces of chassis from the previous generation GS, IS convertible, and current IS. But that makes it inherently heavy – heavier in fact than any rival, and as such handling is compromised. Even with an optional torque vectoring rear differential, handling is on the side of wayward, with grip levels being overcome by weight. The steering is incredibly rapid, but feels inconsistent in its responses, which leads to an uninspiring drive. Surprisingly, considering the handling isn’t exactly sharp, the ride quality is severely lacking. Over broken surfaces, the ride is choppy and overly firm. Every imperfection rattles its way through the chassis and steering setup. The only saving grace to the RC F are rather decent Brembo brakes that produce solid stopping power and resist fade even on track. The RC F’s most characterful trait is its most rebellious – the 5.0-liter naturally aspirated V8 is an updated carryover from the old IS F, now with outputs of 467 horsepower and 389 lb-ft of torque. But the latter figure only arrives at 4800rpm, so you have to wring the V8 out to redline to get the most of it – oh the joy! Rear wheel drive is the standard and only choice of driven wheels, through an 8-speed automatic gearbox and an optional torque vectoring rear differential. Shifts are snappy, but not always prompt – yet the RC F manages a claimed 0-60mph of 4.4 seconds. Standard equipment on the Lexus RC F includes dual zone climate, powered front seats, and a reverse camera system. Options packs include a Performance Package hat adds carbon fiber exterior trim and a torque vectoring rear differential, heated seats, and blind spot monitoring. But the Premium Package is the one you want, with heated and ventilated seats, rain sensing wipers, and blind spot monitoring. As for safety equipment, there’s available park assist, blind spot assist, and a pre-collision system, in addition to standard airbags, ABS, and stability control. 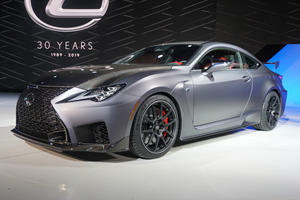 The RC F hasn’t been crash tested, but the RC is an IIHS Top Safety Pick +. The Lexus RC F eschews turbos for an old school V8 and rear wheel drive, but other than the sonorous 8-banger, there’s little to really love. Sharp styling is countered by dull and unpredictable handling, and poor ride quality. Ultimately, you’re better off with any other rival in class. Driving dynamics will be high on the priority list. 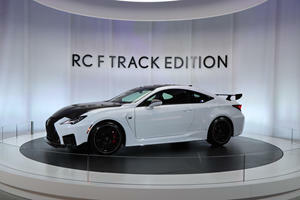 Thought the RC F Track Edition was just a one-off? Hybrids haven't taken over (yet).